Most of us have swerved a few wrong turns or hacked through some questionable trails and cursed the map. Most of us, though, wouldn’t spend seven years and engage dozens of experts to make a better one. Then again, most of us aren’t Bradford Washburn. This climb-every-mountain polymath was let down by the sketchy trail maps of the Grand Canyon available in 1969. At the time, age 60 and director of the Boston Science Museum, he knew what made a good map. Washburn was the first climber to scale 20,320-foot Denali and his map of the peak is still considered the definitive map of the region. A pioneer in aerial photography, he’d go on to map Mount Everest and the Presidential Range. But it’s his National Geographic Grand Canyon map, finally published in 1978, that illustrates his “extreme dedication to the craft of map making” says Betsy Mason, co-author of Nat Geo’s All over the Map blog. 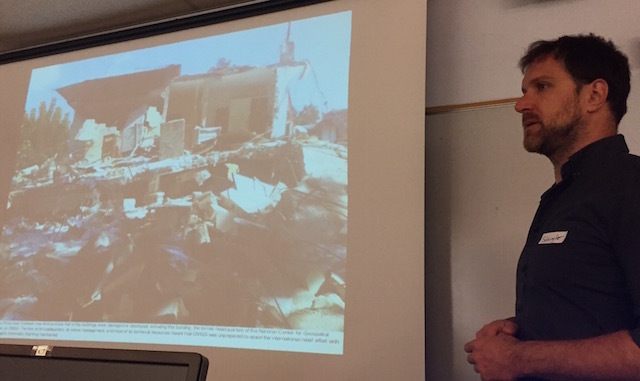 Mason previewed one of the 80 stories and showed off some of the 200 maps from forthcoming book she wrote with colleague Greg Miller titled “All Over the Map: A Cartographic Odyssey” at the recent California Map Society spring meeting. It was the best of crowds (people who readily chime in with the correct pronunciation of “theodolite” and already grasp the merits of hachuring) and the worst of crowds (after lunch on a warm Saturday) but the story behind the Grand Canyon map kept people mostly awake and ready to push over the 45-minute session limit with questions. 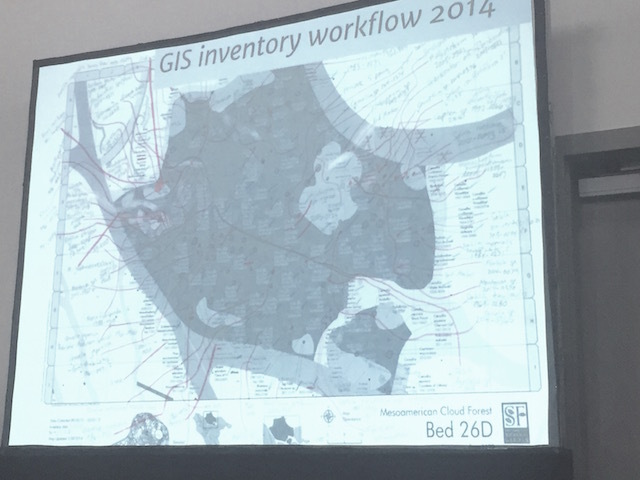 Mason and Miller first started the Map Lab blog back at Wired, then moved it over to National Geographic in 2013. 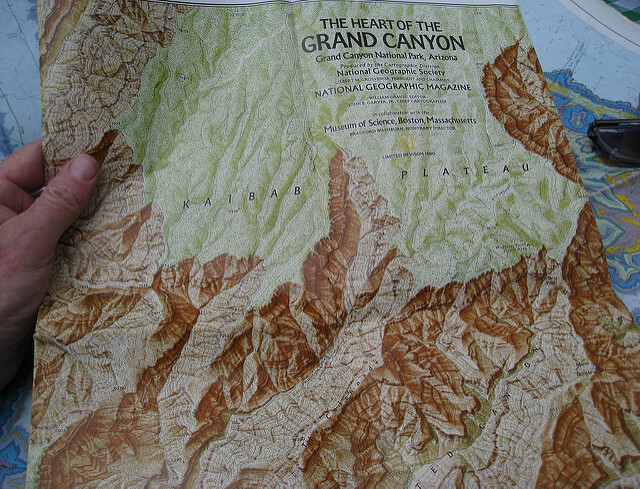 Mason, taken with Washburn’s Grand Canyon map the first time she saw it, went archive diving at her new employer’s and found a “huge trove of boxes” about the making of the map. If you drive, walk or bike in San Francisco you know what a nightmare the ride-hailing services can be. So now the city is interested in adding ride-hailing passenger pick-up zones in a horse- trading effort to wring more data from these startups. The San Francisco Examiner reports there are seven proposed “loading zones” and maybe one or two will be piloted. It’s a well-reported story — except that it’s missing a map. 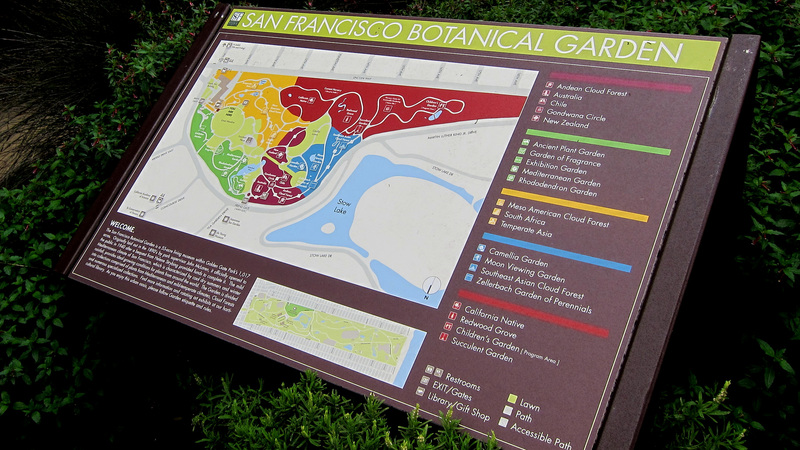 The neighborhoods are Hayes Valley, Inner Richmond, Inner Sunset, Noe Valley, North Beach, Marina and downtown. Also, once they’re mapped, if you zoom in it’s apparent that the length of these zones varies widely. The North Beach one looks like road rage waiting to happen. Full story over at The Examiner. Most visitors to Venice drift through the canals on gondolas taking selfies. 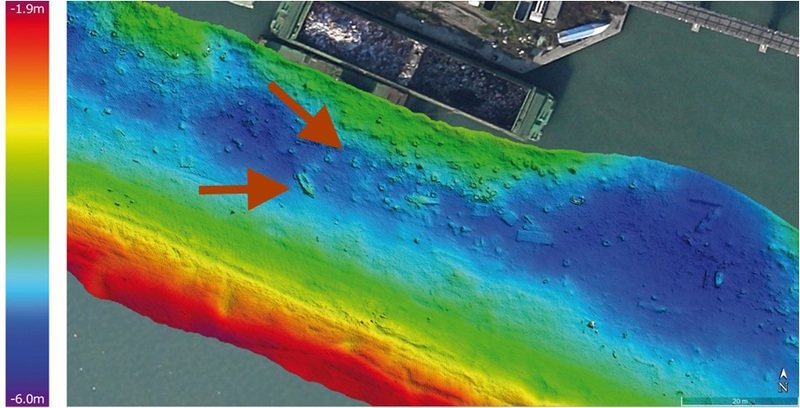 But a group of researchers spent seven months puttering along pointing high-resolution multibeam echosounders into the waters instead. 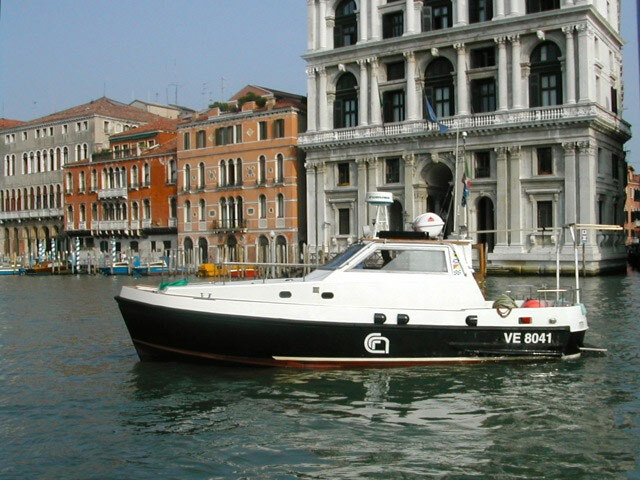 About 30 of them in all worked aboard the powerboat Litus, intent on mapping the Venice lagoon to gauge the effects of climate change on one of the world’s most improbable cities. 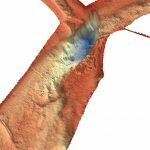 While what’s under those gray-green waters isn’t exactly surprising — boat parts, old tires and containers — scientists say the underwater elevation mapping (that’s “bathymetry,” for the technically minded) comes at a critical time. Old boats, tires and containers. Image courtesy Ismar-Cnr. The last 100 years have radically altered the shape and ecological makeup of the lagoon, researchers say: for starters, salt marsh areas shrunk by half and underlying sediment has radically shifted. The “floating city” already struggles to stay above water in the spring and summer floods and relative sea level rise is expected to increase their frequency. The Mose system, with its 78 mobile gates that can hold back almost 10 feet of water, construction launched in 2003 and is said to be near completion in 2018. Entrance to Malamocco port 1) Mose gate 2) 48-meter (157-foot) trench 3) the oil refinery canal. Image courtesy Ismar-Cnr. “Before the Mose system begins to function, it was important to have a full picture of the bathymetry and currents of the tidal channels and inlets, which are the most dynamic portion of the lagoon,” researchers say in a paper published in “Nature.” They caution that the relatively rapid erosive process could threaten the stability of the “hard structures” (read: priceless palazzos) in the near future and should certainly be periodically monitored. 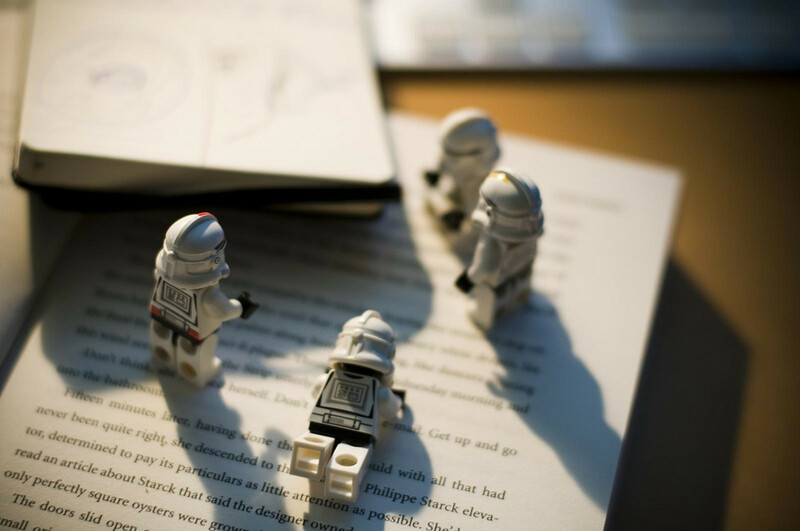 If you want to dig into the datasets, the scientists from research groups (Ismar-Cnr and Iim) have CC-licensed and made them available online with the paper. A scour hole found where two channels meet. Image courtesy Ismar-Cnr. 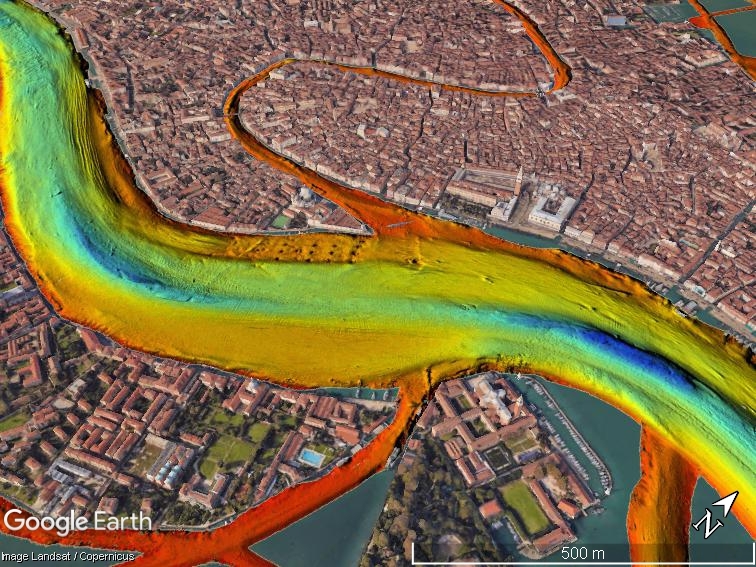 Part of the reason these Venice maps look so trippy (or alarming?) is due to the city’s curious geography, perching atop 118 islands bridged by canals. On most bathymetric maps, deeper waters are represented by soothing darker shades (green, blue, violet) and warmer colors (red, orange, yellow) represent shallower waters. A bathymetric map of the San Francisco Bay by comparison looks, well, a lot more soothing despite its notorious currents. Map heads all know about Piri Reis, Turkey’s mysterious master cartographer. 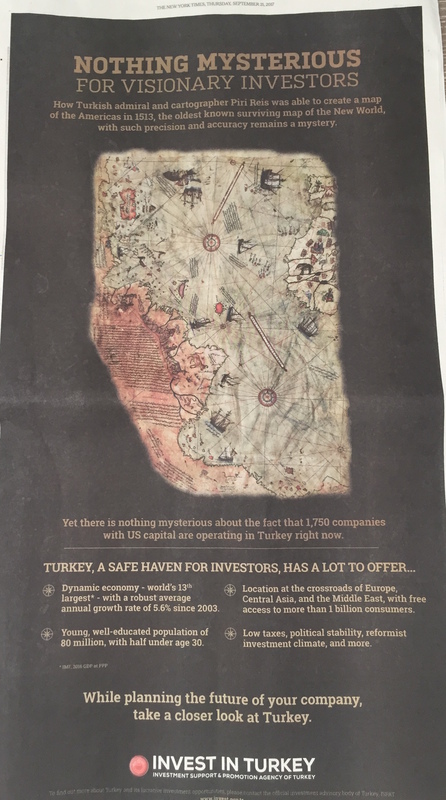 Now his 1513 world map stars in the full-page color advertisement below taken out in the September 21, 2017 national edition of The New York Times. CC-licensed, via hatalamas on Flickr. If you write about tech, you’ll find the Associated Press Stylebook is a little bit like Dear Abby. By the time the bouffant-hair-and-matching-handbag set gets around to addressing an issue, it’s often already been answered by collective common sense. Still, it’s nice to see the venerable news organization writing about data journalism in the same update where it finally relinquishes capitalizing the word internet. 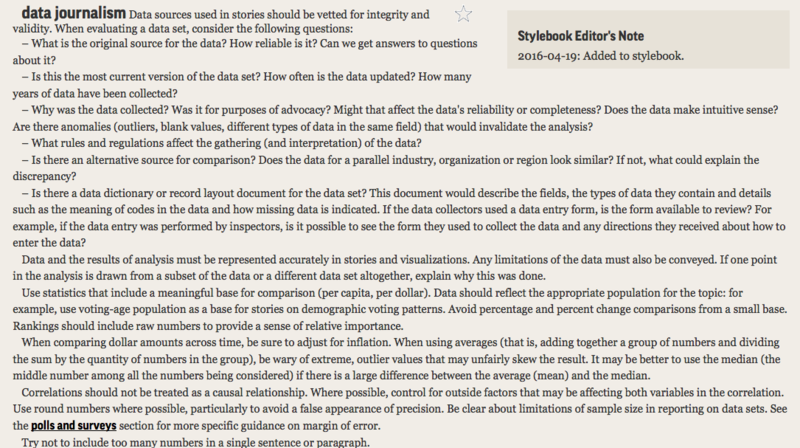 The AP Stylebook entry on data journalism, added 2016-04-19, weighs in at just under 500 words. The next section launches into the math of doing data journalism, a reminder that word people are often not numbers people. Or a reminder to all that, yeah, elementary school math is good to know. “Avoid percentage and percent change comparisons from a small base. Rankings should include raw numbers to provide a sense of relative importance. Proving a point about data with the author’s wedding photos. Nathan Yau is a self-appointed cicerone who shows the rest of us around the big, beautiful data visualization world. A statistician by trade, the likeable, plain-speaking Yau runs Flowingdata.com. And, like all good tour guides, his job is to get you to think about what he’s presenting, not just drop your jaw at the sights. In “Data Points: Visualization That Means Something,” [public library] Yau wants you to think about sample size — even if he has to show you with a jar of gumballs. 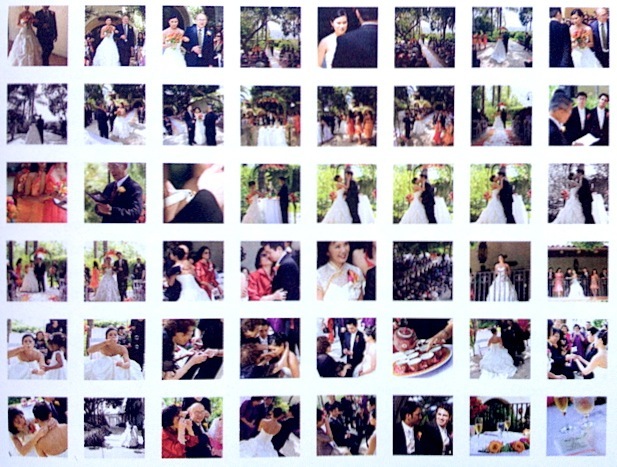 To bring home the point about data representing real life, he takes out his own wedding photos. Later in the book, he manages to transform an eye-crossingly dull table of U.S. education stats into 29 different graphics to show how it’s done.